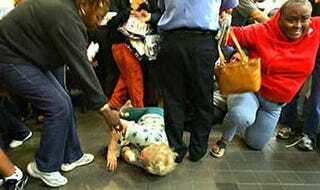 Question of the Day: Who Is Most to Blame For the Walmart Trampling Incident? Black Friday horror stories are inevitable, but nothing can compare to the trampling death of a 34 year old Walmart employee. But who is really to blame? Let us know—and feel free to vent. Oh, and to make matters worse, the police investigation of the surveillance tape is not turning up any leads—so the people involved in the incident will most likely get away scott free. Who is Most to Blame for the Walmart Trampling Incident?